I haven't kept it a secret that I am a candle fan. Anyone who has ever visited my home, can tell that I have a passion for candles. We have them in every single room, and have all different brands, scents, and styles. So I am always on the lookout for any new, and exciting candles to try. 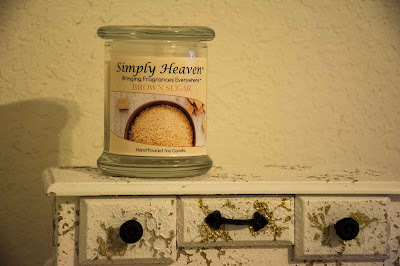 So when Simply Heaven contacted me, wanting me to review one of their candles, I jumped on the opportunity! The first thing I noticed when browsing the scent selection from Simply Heaven, is their selection of unique scents. A lot of times, when you shop different candle stores or websites, you notice similar scents - But Simply Heaven has truly unique scents, like their candied yams, or carrot cake scent. I personally went with a scent that I also found to be unique - Brown Sugar. Now, I've never seen a brown sugar scented candle. I love sweet scents, that remind you of fall - So it was an easy scent choice for me to go to. These candles come in one size, and are available for a fair price of $16.50. I've already had hours of enjoyment with my candle, and definitely find the price point to be right on - Especially when you take into consideration that these are hand poured soy candles. Overall, Simply Heaven candles are a brand I would personally recommend. These are going under the Christmas tree this year, for sure - Because my grandma has already made comments about wanting one for her room. Disclosure: I received free product in exchange for this post. All opinions expressed within this post are my own, and were not influenced in any way. Must be 18 years or older to enter. Open to US ONLY, No P.O. Boxes. NO PURCHASE NECESSARY. This giveaway starts on October 17th, 2016, and will end on October 30th, 2016. Winner will be drawn via Random Generator on GiveawayTools, and will be announced on top of the giveaway form, as well as on the top "Winners" page. The winner will be emailed, and will have 48 hours to respond to my email before a new winner will have to be drawn. If you're tweeting for entries, you must have an "unlocked" account. The number of entries received determines the odds of winning. VOID WHERE PROHIBITED BY LAW. I'd love to try the pumpkin spice - my favorite fall scent!! 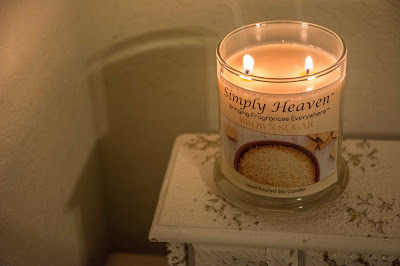 I would like to try Simply Heaven's Candy Cane scented candle. I want to try the CINNAMON BUNS candle. I'd love to try the Vanilla Cotton! I would love to try the lilac scent. I would love to try the French Vanilla scent-one of my favorites! Since its fall, I would like the Pumpkin Spice!TY! I would most like to try the pumpkin spice. I would love to try the Lilac scent! The Pumpkin Spice is the one I'd love to try. The scent I would like to try most is the cinnamon buns. I would love to try the apple cinnamon. I love this scent in the fall. I would love to try the carrot cake scented candle. I'd love to try the Christmas Tree scent or maybe the Lavender. Thank you for the chance to win Amanda. I'd love to try the French Vanilla! Love Vanilla!!! Have to go with the pumpkin spice, I love pumpkin spice everything! I would love to try the Brown Sugar Scent -- sounds interesting. I would love the Cinnamon Bun candle! Would be an awesome scent, but probably a tease to everyone here haha. I enjoy things that have a good aroma to it, and candles are the perfect item. Umm, the brown sugar sounds so sweet! I would love apple cinnamon scent. Like to try the Cinnamon Spice or Christmas Tree. I'd love to try brown sugar, it tends to be my favorite smell in lotions and body washes and I've been looking for it in candle form for years! The French Vanilla sounds amazing! I would love to try the cherry blossom scent. It's one of my favorite smells! I'd Love to try the pumpkin spice too! The Sugar Plum and Spice scent sounds like one I would enjoy! Apple cinnamon or French vanilla! Pumpkin spice or french vanilla please!! I would love the Carrot Cake scented Candle. Oh my there are so many scents that I love! The Tulips, Sunflower, Rose Petals, Watermelon, Mango, Pineapple, Apple Cinnamon, Cherry Blossom, Christmas Tree, Cinnamon Spice, Lavendar, Lilac, Lily of the Valley...I don't know which one to choose!?!?!?!? So, with it being fall, I will have to choose Apple Cinnamon or Cinnamon Spice. They both are so similar Thanks!!!! I would love to try the Lemon Drop, I love the smell of lemon and I'm obsessed with candles. Brown Sugar: Hand Poured Soy Candle. Like you, I LOVE the smell of sweet smelling candles! And you don't have to worry about counting calories, just inhale and breathe deep! Ahhhh, I love scented candles! I would love to try the French Vanilla. No matter how many scents I try, I always come back to vanilla. I'd love to try the Sliced Apples scent. I would love to try the lavender, lilac or Lily of the valley. I'd like to try the cinnamon buns and french vanilla scents! I'd really like to try the Carrot Cake scented candle. Thanks. I would like Pumpkin Spice if I win. I'd love to try the pumpkin spice. I would love the carrot cake scented candle. I bet that smells super yummy and i tend to prefer candles that smell like I've been baking. HAWAIIAN BREEZE IS THE SCENT I AM MOST INTERESTED IN TRYING. I would like to try the Cinnamon Buns candle! I would love to try the pumpkin spice scented candle. Because it reminds me of fall, and I love Thanksgiving. I would love the Cranberry scented candle! I would like to try Cherry Blossom. I think I would love their Lilac: Hand Poured Soy Candle. Here in Iowa lilacs are a sign summer is coming yet it is still spring. I have a huge lilac bush and open the windows and can smell how terrific it smells. I'm in the mood for Christmas Tree! The pumpkin Spice scent would go great for this season. I like it especially for Thanksgiving. I would love to try the French Vanilla scent! Vanilla is my favorite scent in most things.